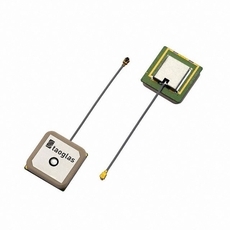 The AGGBP.25A is an internal GPS/Galileo/Glonass/BeiDou active patch antenna with �1.13 cable and IPEX MHFI (U.FL compatible) connector. It is the ideal antenna for next generation GNSS devices to achieve good sensitivity across all bands in a small form factor. The active patch antenna, by means of a double resonance design, has a wide-band operation over GPS/Galileo/Glonass/BeiDou systems from 1561MHz to 1606MHz. It includes a one-stage LNA and front-end SAW filter to reduce out of band noise, such as from nearby cellular transceivers. This antenna offers better protection from nearby radiated power surges and greatly reduces the probability of damaging your GPS/Galileo/GLONASS/BeiDou receiver due to nearby transmissions. The patch, the ground plane, the LNA, and front-end SAW components are all integrated in a dimension of 25.1 x 25.1 x 7.9 mm, connecting with a �1.13 60mm long coaxial cable and an IPEX MHFI connector. The AGGBP.25A is manufactured and tested in a TS16949 first tier automotive approved facility. The cable length and connector type can be adjusted for a MOQ. For further optimization to customer specific device environments, custom tuned patch antennas can be supplied, again to a MOQ. For more details please contact your regional Taoglas sales office.